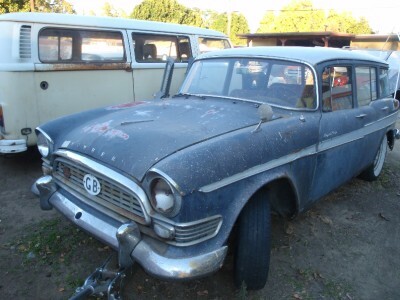 Humber was part of the Rootes Group. These cars were officially sold in the US, but not very well promoted. Rootes chose to emphasize its line of economical Hillman cars and the sporty Sunbeam brand. The most interesting of the two is the station wagon. 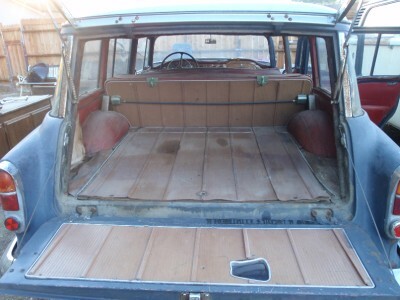 It is one of the few British station wagons we officially received in North America. The engine is a straight 6 (most likely a 3.0 liter, as my best guess is this is a Series II Super Snipe). It wasn't Jaguar-straight-6 powerful, but it made the car better suited for US driving than most of the 4 cylinder imports of the day. The car has an American look to it on the outside, with lots of chrome and small fins and a distinctive British luxury look on the inside, with chrome surrounded gauges, leather, wood and the uniquely British picnic tables in the back. The sedan is a Series III. It is in better shape than the wagon. It, like the wagon, has an American look on the outside and British luxury on the inside. These cars are in rough shape, but certainly restorable. The sedan wouldn't be too tough, but the wagon would take someone with a real passion for Humbers and a lot of patience, time and money. Humbers are not worth a lot of money, so anyone taking on these cars would be doing it as a labor of love. They'd get a ton of "car geek points" in my eyes. The sedan is located in Florence, MA. (That's just a few miles from where I live. I hope after photographing it the seller put it back in the barn. We got a lot of snow the other day.) Click here to see its listing. The station wagon is located in Northridge, CA, click here to see its Ebay listing. Ran When Parked, that's like nails on a chalkboard to me, the only thing worse is when someone mentions that his wife had Anything to do with the fact he's selling his car. Dude have some freaking Balls!!! Ok, back to this ran when parked, Um...Like maybe take a day and TRY to get the damn thing going again!!! "Ran when parked" is a lot like saying, "looked good until it was totaled".